I'm watching the Running Man subbed now, and Soo Hyang is so darn adorable! I hope we see her on many more shows. The fact that they introduced her as "My ID is Versatile Beauty" may have made me the happiest of all, lol. Our Dorae couple for Atelier cologne. These two should have a photoshoot together. They will look great. CEW's photoshoot for Atelier and Nylon? Iconic! Isn’t ISH endorsing Atelier Cologne as well in one of her magazine photoshoot? Are they going to be at an event together for atelier??? omg this sounds so exciting!!!! Thanks for posting that @monica63! Looks like she's getting a gift as an ambassador. And that art is so precious! Only 4 days away from their Cebu vacation. I hope they enjoy it, have a lot of fun, and get a lot of rest. And I won't say no to them posting pictures lmao! 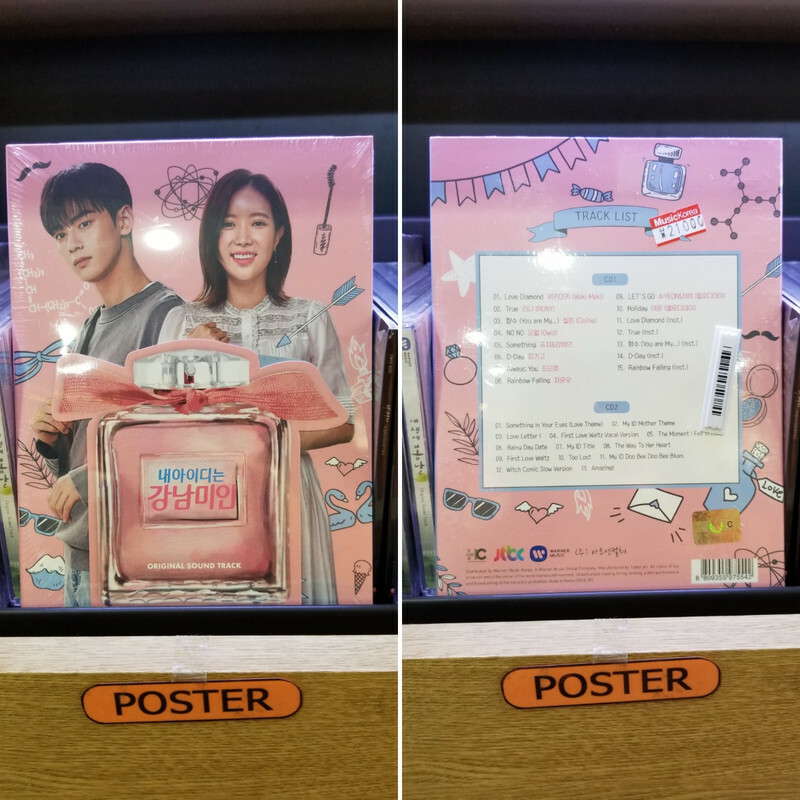 Visited the Music Korea store in Seoul and saw this!! I heard CEW n MB will feature together for nylon magazine!! P. S. Can we have our DoRae together!! Hope DoRae come together for atelier event.. I guess ISH will be coming as she shared abt it in IG.. But CEW, he is soo busy nowadays!! I m just waiting for Cebu trip Now to see DoRae together!! @susieunnie My soundtrack arrived last week, and I'm in love with it! So happy for you that you got to see Astro perform, even if it was only a few minutes lol. The main character undoubtedly shows the reality that many young people, not only in Korea, but in the world, suffer from not following a certain pattern of beauty and how it affects them in society. Even after the plastic, people continue to comment on the girl's appearance and condemn her, showing that people need to change and not you. Unlike other dramas that tried to convey a similar message, this one shows the more realistic side of the thing, by focusing on other characters and their insecurities and how they overcome it. Kang Mi Rae played by Im Soo-hyang - We might have been angry, because she is very meek. But for the first time, the fact that the main character was "weak" did not bother me. I think it worked well she always turned the "other cheek" to the people who treated her badly. Kyung Seok played by Cha Eun Woo - This character deceived me. I thought he was going to be annoying, but he was only closed off. At least somebody noticed the snake that inhabited that faculty, which compensated for the fact that Mi Rae did nothing. We need more nice male characters like Kyung Seok, seriously. Hyun Soo-A played by Jo Woo-Ri - Congratulations to this actress who was the perfect villain. It's impossible not to hate her, she's a liar and still tries to ruin our ship. But in the end, the script tells the story of her character, and it is up to you to understand her or not. Woo Young played by Kwak Dong-yeon - This actor is marvelous! His character is very cool, and he's also from being scum (amen!). Do you know the neighborhood Oppa that every drama has? Sure, this guy is him! The boy is super kind and always willing to help the college kids. @kangminjae I like this part from Knowing Brothers. She is so honest .She claimed that she went to the clinic to do uplifting and practise her dance for 2 months. I hope that Eunwoo and Soo Hyang will go to Paris together. A romantic city and they deserve to go. Eunwoo has literally become a super star after MIIDGB. He is working non-stop. Every company wants him to endorse their products. To many fans , this couple looks perfect for each other and Atelier Cologne knows that. Therefore both became ambassadors,lol. I am really looking forward to their trip in Cebu and waiting for updates from Soo Hyang and fans from Cebu. My fb friend from Phillipines says that she will get her Cebu friends to give us updates and I hope to hear interesting news from them. Meanwhile, we do our part and start nominating Soo Hyang again in AAA awards and 100 most beautiful women. @monica63 I hope they both get some good relaxation and fun time!! And I hope we get to see at least some of it, but fans should understand if not, since it is their vacation after all! Especially CEW, he's been doing concerts and appearances non-stop, and endorsements.. I'm happy he is becoming more well known because he is so talented and the world needs to know about him haha. But also hope he slows down every now and then and enjoys life too since he is 21! Gosh he's young but could fool me since he's mature in many ways and well spoken. @kangminjae thank you!! I love all the songs on the soundtrack too! I even heard some stores playing songs from it! According to the comment section of Soo Hyang's post, she will be dropping by the Atelier on the 19th and then flying out to the reward vacation in the evening. I wonder if Eunwoo will accompany her, then, since I assume they'd take the same flight anyway. Almost every clip have engsub already. Let see. Ppl r hoping that they could drop together as she mentioned #dorae in the post.. I m also hoping that these two will attend it!! Oh, man! The BTS videos are all subbed now? Time for me to waste my whole afternoon watching them, lol! LOL same.. it's not a waste!!! It's fun to watch now and understand all of it!! Vote for ISH n CEW!! Thank u guys for all the updates! AAA voting is almost there! Let’s do it anothe round!